Grevilleas are Australian through and through growing in their many forms all over the continent. 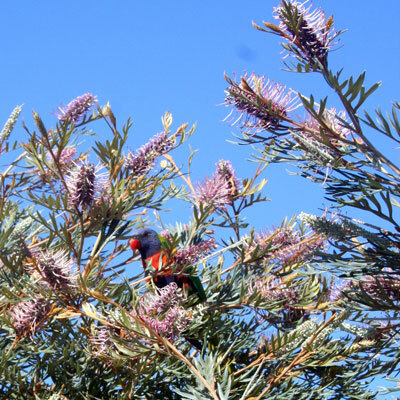 From ground cover shrubs to the taller trees of Grevillea robusta there is a special Grevilleas for every use. Grevillea ‘Dorothy Gordon’ is a large compact shrub which bears the usual nectar laden blooms for most of the year. These are a boon to honey eaters, birds and possums and other small animals at night coming in to be satisfied with the honey feast they get from the plants. Flowers are useful for floral arrangements as they last well for several days. The foliage is fern like, showy green coloured with bronze new tips as the plants grow. It makes an outstanding feature plant in gardens around the coastal and inland areas of the country. ‘Dorothy Gordon’ is a large shrub growing to around three metres in good conditions. Most soil types are suitable for its culture. Keep a good layer of mulch around the drip line of the plant to cool the soil and conserve moisture for best flowering. ‘Dorothy Gordon’ is a plant for sunny gardens with well-draining soils. Light shade is tolerable but flowering is not as heavy. Use as a tall shrub border as trimming is fine but make sure that you trim more than once a year to keep the size and shape you require. Watering is not generally a problem once established. In dry periods give good deep watering occasionally. As mentioned above mulch well to conserve moisture and keep the surrounding soils cool. An addition of native plant fertiliser in late spring and autumn will keep your Dorothy Gordon healthy and happy. Pruning should be done two or three times a year to keep the plant to the size and shape you need for your garden. This outstanding Grevilleas was selected by the Directors of Myall Park Botanic Garden near Glenmorgan, Queensland and honours ‘Dorothy Gordon’, a renowned water colour artist and wife of Dave Gordon. Myall Park Botanic Garden Ltd, a non-profit company is owned and operated by a Board of Honorary Directors. The plant was selected from a batch of self sown seedlings at Myall Park.